Are you looking for the perfect partition to separate the bar and restaurant area? Something unique and eye-catching? Then look no further. Our restaurant and bar partition named Facet is just what you need. It is stylish, modern and fully customizable. The amazing design of our room divider will add the finishing touch to your restaurant and bar. Your guests will be in awe of the pleasing geometrical pattern while enjoying the privacy it provides by dividing the restaurant from the bar area. Modern design restaurant and bar partition. 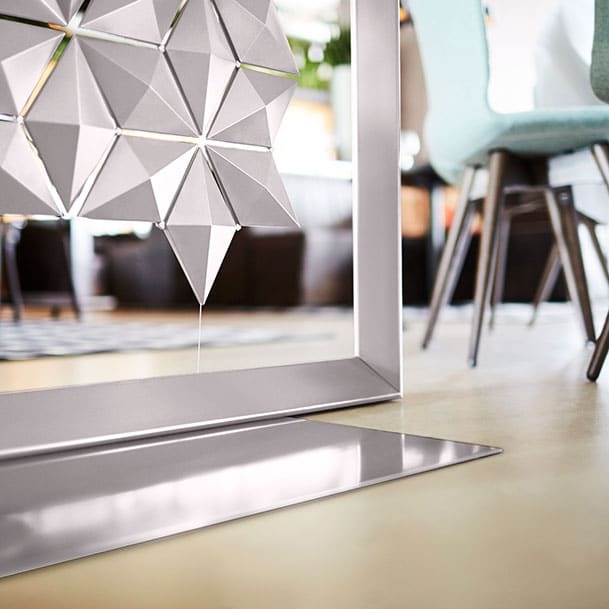 Our room divider, Facet, consists of multiple facets that you can rotate. This clever design enables you to adjust the transparency of the restaurant and bar partition. By rotating the facets you can also change the look of its pattern. You can play around with the architecture of your space by strategically turning some facets to a horizontal and more open position. In this way you allow your guests to strategically peek through to the other side of the partition. The partition you can customize. Another great thing about our restaurant and bar partition is that it is freestanding. When the layout of your space changes, you can easily move Facet to where you need it. Its clever, light-weight design makes moving it around super easy. It is also exceptionally easy to assemble. A simple to follow manual is sent with your order and you can call us in case further assistance is needed. You can also choose from a range of colors and sizes. The picture of our restaurant and bar partition featured on this page is in Wynwood, a restaurant in Eindhoven, the Netherlands. The size of this specific restaurant and bar partition is 170 x 219 cm, but you can order your partition in almost any size you want. The partition you see here is in the color Pearl Gray. Take a look at our product page to see all the different colors you can choose from. If you can’t find the color you are looking for, it is even possible for you to contact us and choose your own custom color to complement your interior.